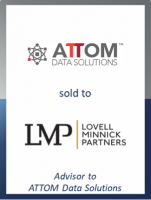 GCA is pleased to announce that our client ATTOM Data Solutions, a leading provider of national real estate data and analytics, was acquired by Lovell Minnick Partners. Financial terms of the private transaction were not disclosed. Headquartered in Irvine, California, ATTOM manages a comprehensive data platform that draws upon a wide range of sources to provide property tax, deed, mortgage, foreclosure, environmental risk, natural hazard and neighborhood data for more than 155 million U.S. residential and commercial properties covering 99 percent of the nation’s population. ATTOM licenses its data to companies in the real estate, mortgage, insurance, marketing and adjacent industries. Lovell Minnick Partners, a private equity firm specializing in financial and related business services companies, acquired ATTOM from Renovo Capital and Rosewood Private Investments. Lovell Minnick will continue to support management in executing its strategic plan to build the leading technology platform in the real estate data industry. GCA acted as exclusive financial advisor to ATTOM in connection with this transaction.